The 40 minute easy run was just that. 5 miles without the Garmin so I could just run without looking at my pace all the time. It was hot, but the run was relaxing. 1 week and a day to until Lean Horse! Most of my thoughts during the run today were about planning for this 50 mile race next weekend. I would like to think I could just show up and run 50 miles, but unfortunately, there is lots of planning to do. I have three columns across a spreadsheet regarding mile splits. 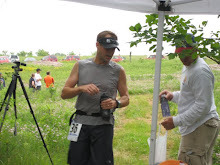 The forth set of times is a bit different, as it show a pace between aid stations, but than adds 2 minutes for each aid station for walking and refueling. I then have sections titled: Packing List, Aid station list, Drop Bag 1 list, Drop Bag 2 list, and shopping list......The planning for this race has been just about as hard as the training!! I know you can't read the picture below, but if you have any suggestions about anything to inlcude, please let me know! By the way, the drawing in the lower left hand corner is a duffel bag. The duffel bag has three various sizes of Ziploc bags inside of it. The three bags are: a small bag of must grabs at each aid station (Clif shot blocks, pre-measured electrolyte mix, sunscreen wipes, etc. ); the second bag is a change of clothing (Socks, Shoes, shirt, etc. ); the third bag is a what if bag (band aids, toothbrush, athletic tape, etc.) Yes - a toothbrush - if I have to puke, I'd like to be able to brush my teeth - especially since I'm wearing braces right now! I noticed I forgot to list my (wife's) Ipod and have since added it to the list. If anyone has any suggestions regarding some good workout songs, let me know. 50 miles is a long ways, and an eclectic mix of music may do some good. I can listen to anything from country to hard rock to classical.